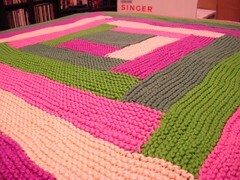 Knit this for the new niece, to match her pretty new room. It took a long amount of subway knitting, almost 2 months. The yarn is wicked soft, a little splitty and yes, shiny. I worry about the woven in ends working themselves out since the cotton/modal is so slippy. Overall I'm pleased with how it came out.